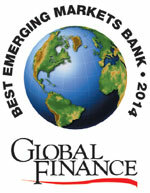 New York, March 17, 2014 - Global Finance magazine has named the World’s Best Emerging Markets Banks in Africa in an exclusive survey to be published in the May 2014 issue. Global Finance editors—with input from industry analysts, corporate executives and banking consultants—selected the best emerging markets bank in the region and in 31 countries. “Faced with slowing growth and volatile markets, these banks are star performers under increasingly challenging conditions,” said Joseph D. Giarraputo, publisher and editorial director of Global Finance . “The banks that Global Finance is honoring may not be the largest or oldest, but they are the best at targeting their products and offerings to the specific markets they serve."